Each fall when my style magazines come out - and the new fall items hit the stores - I want to buy everything, but without an endless budget, I have to limit what I buy. Today, I am sharing how to update your wardrobe staples with a few simple, budget-friendly pieces - that can take an existing look and make it look “new”. These trendy items will hopefully make you feel great and look super chic. I know when I add something new - even something as simple as a new shade of lipstick - I feel prettier and more confident. The look above I built from a few basic pieces - black denim, a white top (either turtleneck or tee or even a blouse), and black boots. I incorporated faux leather jeans to show how to easily they can be styled (for any age) - but they can easily be swapped out for just black denim. Also, you could switch the over the knee boots with short booties, tall boots (under the knee) or even flats. And, if you don't like black jeans, you could wear a dark denim. Also, if skinny jeans are not for you - flares would work great or even bootcut. A fedora is the hat to buy right now. Back in my day, it was the baseball cap, and today the on trend option is the fedora. You do not need to spend a lot of money on one. I have found some options for under $30 - some as low as $12. If this is your first hat, I would stick to a neutral color - beige/tan, gray or black, because it is most versatile. Depending on the colors in your wardrobe, you could try a burgundy one. The new “go to” cover-up is a poncho. Ponchos from the seventies are definitely back. You can spend as much or little as you want. I got this plaid poncho for $38 - and I love it! You definitely do not need to spend a lot of money. I thought this trend might fade - but it is still going strong and does not seem to be fading anytime soon. These big blanket scarves you can wear loosely around your neck or you can even belt them and wear them more like a poncho. Scarves are a great layering piece for the fluctuating fall temps, and are a great budget-friendly way to update an existing outfit. I think burgundy is a rich beautiful color - that just says “fall”. You can easily incorporate some burgundy into your existing wardrobe - through a new bag, shoes, boots, or even something as simple as lipstick. Here are some other looks for fall and ways to incorporate wardrobe basics of black denim and boots. #1: Black denim, neutral tunic sweater, black booties - here. 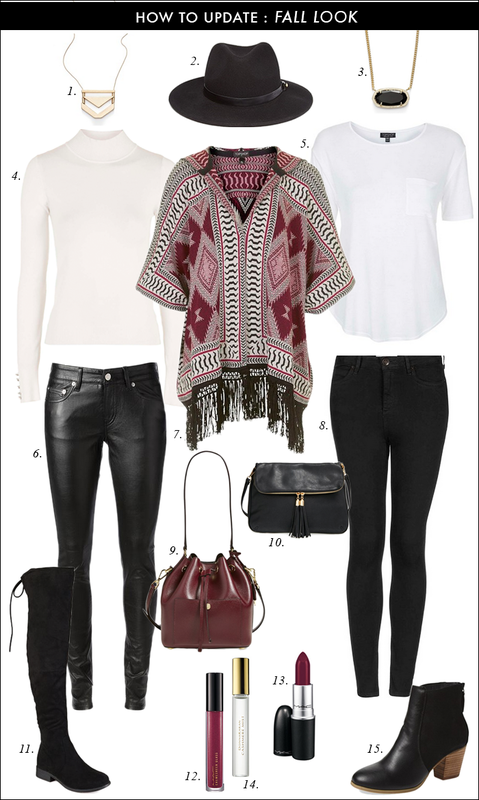 #3: Cozy long cardigan, jeans, and boots - here. Awesome fashions, thanks for sharing! I love all of these picks! As a college student, I find it so hard to shop without my wallet being sad for months afterwards, lol! I'm so glad you posted this! Totally agree with this list! I posted about ponchos on my blog today, too! They are a great, versatile piece for fall! Great picks! One or two new pieces that you can mix in with your basics can really change up a look! I love all of the burgundy! Such great tips! I love staples like my black denim and boots. I finally just bought a new pair because after two years mine was looking pretty faded. Your add on are great choices. I almost bought that striped oversize cardigan while in Topshop in NYC, and I totally regret not pulling the trigger. Fantastic picks! 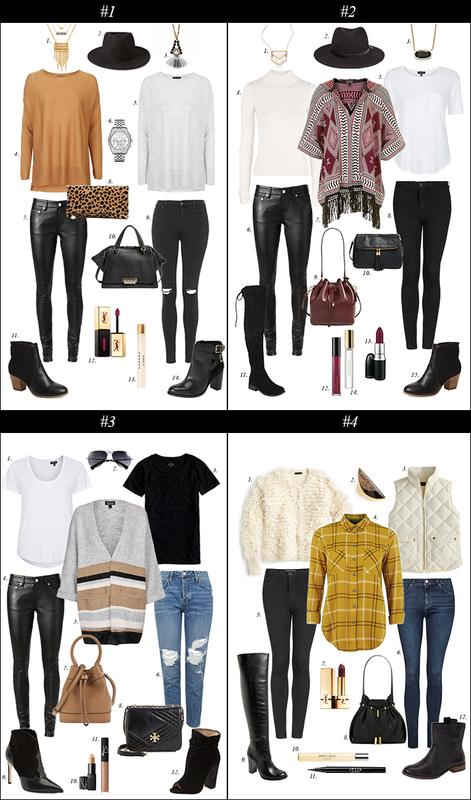 love the style ideas of #2 and #4...the faux leather pants are such a fantastic fall staple..
Pinning this post! Those OTK boots are such an amazing find! This list is amazing! I want all of them! Amazing picks! The black over the knee boots and that burgundy cross body bag are beautiful! I also love that hat and the lipsticks, all of them are gorgeous shades for fall! Love all of these picks! I want it all! Those OTK boots are fabulous, and that bucket bag is a gorgeous color. Quilted vest in the #4 outfit looks fabulous! Thanks for sharing these fall items!